Provence (Provençal Occitan: Provença in classical norm or Prouvènço in Mistralian norm) is a region of southeastern France, located on the Mediterranean Sea adjacent to the Italian border. It is part of the administrative région of Provence-Alpes-Côte d'Azur. The traditional region of Provence comprises the départements of Var, Vaucluse, and Bouches-du-Rhône in addition to parts of Alpes-de-Haute-Provence and Alpes-Maritimes. The coastal area of Provence was settled by Greeks and Phoenicians from around 600 B.C.E. onwards, and Marseille (known by the Romans as Massilia) became one of the great trading cities of the Mediterranean. By the end of the second century B.C.E., Provence had become the first Roman possession beyond the Alps, and was thus given the name “Provincia” (“province”). The fertile valley of the Rhône and the French Riviera produce fruits and vegetables (citrus fruits, olive oil, mulberry trees), and cattle are raised in the Camargue. Although Provence is not as famous for fine wine as other regions of France, its official status is now being upgraded. The startling scenery has inspired such painters as Cézanne and Renoir. The region of Provence comprises the Mediterranean coastline of southeastern France and is bound by the Alps and Italy to the east and the Rhône River to the west. It has varied topographical features, ranging from fertile plains in the Rhône valley to mountains in the east (notably Mont Ventoux, the Luberon range and the Alpilles), to marshlands in the south (the Camargue).The Principality of Monaco is nestled between Nice and Italy. Marseilles, Aix-en-Provence, Avignon and Arles are other cities of importance in Provence. Marseilles, is by far the largest city in Provence and the second or third largest city in France; the principal city of both the 'Bouches-du-Rhône' department and the region PACA (Provence Alpes Côte d'azur), Marseille is also called the chef-lieu (capital city) of Provence. The area of Provence is 12,124 square miles (31,400 sq km). The climate of Provence is typically Mediterranean, warm and dry. However, the legendary Mistral is a strong, cold wind from the north that occurs mostly in the winter and spring. The higher regions of Provence get snow in winter. Summer temperatures can be as high as 44°C (111.2°F). The climate in Provence results from the combination of low annual daylight hours (up to 2900h, only 1600h in Dunkerque in the north of France); overwhelming precipitation (snow and rain), and the wind called mistral (mistrau) which drives out the clouds after short but intense downpours. It rains 330 to 350 days in the plain, but more in the Alps; by comparison, it rains more than 270 days in London. The annual average temperature on the coast is 15.1°C (60°F) in Marseilles to 17.3°C (63°F) in Menton, compared with 16.5°C (61.5°F) in Barcelona, 18°C (64.4°F) in Tunis, and 11.3°C (52°F) in London. During the coldest month, the temperature in the day ranges from 11°C (51.8°F) to 14.8°C (57.2°F) on the coast 8°C, (46.4°F) in London). Provence was known in ancient times as part of Narbonensis, inhabited by Ligurians and later Celts. The coastal strip was settled by Greeks and Phoenicians from around 600 B.C.E. onwards, and Marseilles (known by the Romans as Massilia) became one of the great trading cities of the Mediterranean. From the second century B.C.E. the area was progressively settled by the Romans. In 125 B.C.E., the Massiliots appealed to the Romans for help against a coalition of neighboring Celts and Ligurians. After the Romans defeated the Celts and Ligurians they remained in occupation of the region, and by the end of the second century B.C.E., Provence had become part of Gallia Transalpina. The area was the first Roman possession beyond the Alps, and was thus given the name “Provincia” (“province”). Christianity arrived in Provence very early and the region was already extensively Christianized by the third century C.E., with numerous monasteries and churches being constructed. By the fourth century C.E., Arles, an important hub for commerce, had become the seat of the prefecture of all Gaul, and Marseille was the main center of Greek studies in the west. In the aftermath of the fall of the Roman Empire, Provence suffered successive invasions: Visigoths in the fifth century, Franks in the sixth century and Arabs in the eighth century, as well as repeated raids by Berber pirates and slavers. Provence came under the rule of the Franks around 536 C.E.. After the collapse of Carolingian rule, Provence became one of the kingdoms set up between France and Germany. The first kingdom of Provence lasted from 855 to 863; then the kingdom of Cisjurane Burgundy, which the count of Arles established in 879, united in 933 with Transjurane Burgundy to form the Kingdom of Arles. In 973, Count William I defeated the Arab pirates based at Fraxinetum at the Battle of Tourtour and took the title Pater Patriae. Provence subsequently passed into hands of the Counts of Toulouse as a fief of the Counts of Barcelona (later Kings of Aragon). In 1113 the house of Barcelona gained the title of Counts of Provence, and Provence was ruled by the Spanish from Catalonia for more than a century. From 1032 to 1246 the county was part of the Holy Roman Empire. During the twelfth century, Provençal cities prospered from trade with the Levant, and set up autonomous governments called consulates; at this time the culture of the area was at its height. The Provençal language, (see langue d'oc and langue d'oïl), a language close to Latin, was the standard literary idiom of southern France, and troubadour poetry and examples of early Romanesque architecture were among the outstanding cultural achievements. During the thirteenth century Provence was involved in the Albigensian Crusade. In 1246 Provence became a fief of the French Crown, when it passed to the Angevin dynasty of Naples through marriage; under the Angevins the towns became virtually independent republics. Upon the death of Charles du Maine in 1481, Provence was inherited by Louis XI. It was definitively incorporated into the French royal domain in 1486, with the condition that Provence keep its administrative autonomy. Significant enclaves existed within Provence for many years afterwards: Orange remained under the control of the House of Orange-Nassau until 1672; control of the French king gradually strengthened, however, from the sixteenth to the eighteenth century. In 1673, the généralité of Aix was established as the seat of an intendant (royal governor). The Comtat Venaissin, centered on Avignon, was under Papal rule until 1791; and Nice and Menton were not added to Provence until as late as 1860. The Estates of Provence were not convened from 1639 until just prior to the French Revolution in 1787. In 1790, during the French Revolution, Provence’s political institutions were dissolved, and it was divided into several departments: Bouches-du-Rhône, Var, and Basses-Alpes (now Alpes-de-Haute-Provence). The département of Vaucluse was added after the annexation of Comtat Venaissin in 1791 and that of Alpes-Maritimes with the annexation of the countship of Nice in 1860. The historical region of Provence is roughly coextensive with the present-day région of Provence-Alpes-Côte d'Azur (pop., 2003 est. : 4,665,051), which has an area of 12,124 sq mi (31,400 sq km); its capital is Marseille. 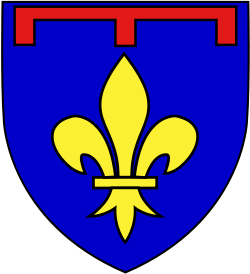 The now-extinct title of Count of Provence belonged to local families of Frankish origin, to the House of Barcelona, to the House of Anjou and to a cadet branch of the House of Valois. Arles, monuments listed as World Heritage Sites since 1981. The population of Provence is mostly Roman Catholic, with sizable Protestant enclaves around Marseille and in Vaucluse around Lourmarin and Merindol. Repatriation of émigrés from North Africa has greatly increased the number of Jews in Provence. Provençal is the adjective used to describe things originating from this region, as well as being the name of the local Occitan language under its regional variety, Provençal. Occitan is a Romance language that is part of the Romance dialect continuum that stretches from Italy to Portugal. Occitan continues to be spoken in the Comtat Venaissin. Music written about Provence includes the saxophone concerto Tableaux de Provence (Pictures of Provence) composed by Paule Maurice; Georges Bizet’s 'L'Arlésienne'; and Darius Milhaud’s 'Suite Provençale'. Fodor, Eugene. 1969. Fodor's France. New York: D. McKay. Pope-Hennessy, James. 1967. Aspects of Provence. Boston: Little, Brown. The Camargue Unique area in Provence: geography, history, economy, ecology, flora, fauna, towns, weather. Maps, photographs. This page was last modified on 11 June 2015, at 18:51.